LaVar Ball: I could coach the Lakers to the title with my eyes closed! 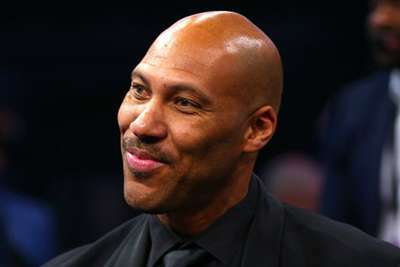 LaVar Ball claims he could coach the Los Angeles Lakers to the NBA championship "with my eyes closed", amid a report Luke Walton is walking on thin ice. The Lakers signed four-time MVP LeBron James in the offseason but have endured a tough 3-5 start to the new campaign, with ESPN claiming president Magic Johnson this week reprimanded coach Walton for their poor form. Ball, whose son Lonzo plays for the Lakers, is confident the makings of a title-winning team are there, though, and offered his services to make it a reality. "If you have Lonzo and you have the best player in the world, which is LeBron James, how do you not win a championship?" he told Sky Sports. "My prediction for this season is the championship. If they need help to shoot, I'll coach them. I can coach them with my eyes closed." And Ball offered some advice on where Los Angeles are going wrong: "It started off a little ragged. "That's because they don't understand: if you have a guy that's your second pick and you have the best player in the world, don't take him out of the game. Leave him in the game and rotate the three other guys around him. "That's how you get victories if you want to win. But if you want to try and figure out things, try different combinations and taking guys in and out, then no. "I'm going to go with Lonzo and LeBron. Those two guys are going to stay in the game until we finish winning. If we're winning by a lot, then everybody else gets to play." The Golden State Warriors have been dominant in recent seasons, defeating James' Cleveland Cavaliers in the last two NBA Finals, but Ball also believes he knows how to beat the reigning champions. "There's only one way to beat the Golden State Warriors – it's to go faster than them," he added. "If you have length and speed you can beat them."